Being a parent means a life full of joy and love, but at times, with a dash of sacrifice and a few heaps of sleepless nights plagued with worries. And us, parents won’t have it any other way. Even when we are not around our kids, we constantly think about them and wonder what they are up to. Perhaps nothing can really take away the constant worries, but if we prepare for it sufficiently, we can be better equipped at providing the best for our children. If one of the family members is ill, the last thing a parent wants to worry about is money. As a parent we want to be able to afford the best care and the best treatment – without a second thought. However, the truth is, medical treatment has become so expensive in recent years that in such a situation, money is the first problem that we have to tackle. One of the most effective ways to prepare for such eventualities is by building an adequate insurance portfolio, not just for the children, but for the entire family. How do you ensure that your insurance portfolio stand the test of time? Starting and raising a family are expensive affairs. One wrong move can result in a financial hit that may take years to recover from, which is why you need to ensure your insurance planning is able to withstand any stress as your children grow up. In 2014, the life insurance penetration rate in Malaysia grew from 41% to 56%. Malaysians are becoming more aware of the importance of getting insurance coverage as the life insurance industry saw an increase of 129,015 in 2015, compared with the preceding year. Meanwhile, medical and health insurance (MHI) take up actually grew 15% in 2015. As more families get protection, finances will likely be stretched thinner as the children grow and the parents age. So, how do you manage this increasing cost for your whole family? One way of doing so is by signing up for one from as young as possible. Parents must seriously consider getting the right and adequate insurance plan for their children. In most cases, the younger policyholder or insured person is, the lower the risks will be, hence, the insurance premium is also lower. Typically, premium prices are lower for younger individuals because statistically, there are fewer young people with diagnosed and undiagnosed health conditions, compared to older people, and hence, they are less likely to develop health problems. However, it’s important to note that infants and school-going children are higher risks than young adults, as they are more susceptible to illnesses and accidents. Having the right protection at all times throughout one’s life can make a huge difference in the family’s finances. It is always more reassuring to know that you have an insurance policy to fall back on if any one of your children falls sick or has an accident. With medical inflation inching up by 12% to 15% per annum, coupled with the escalating insurance premium as you age, you have yourself a recipe for burgeoning family expenses over the years. In 2014, insurance premiums have gone up by 20% due to medical inflation. We wouldn’t be surprised if this happens every few years, bringing your cost of protection even higher. On the other hand, getting an investment-linked plan, like the Zurich FlexiLife Plus, allows you to lock in the insurance premium for your young children, making it more affordable in the long run, and also easier for you to plan your finances for your family. Though the riders may change over the years, but by committing a sum of premium from as early as possible, you won’t have to deal with the definite increment of premium as you and your children grow older. Committing the insurance premiums for your family as early as possible is important in allowing your finances flexibility for different expenses as you grow older, such as saving for your children’s education fund and your retirement. Something many people don’t realise is that insurance is really the foundation of financial security. And financial security is one of the building blocks of a financially stable family. It’s just as important if not more important than your contingency fund! One of the best legacies a parent can give to his/her child is a financial boost when they need the money, be it for tertiary education, or to kick-start their working life. However, amidst the increasing cost of living and also juggling other financial goals and needs, parents may find it difficult to put aside money for their children’s future. By having an all-in-one policy, you are assured of dollar cost averaging your investment as you pay your premium monthly, semi-annually, bi-annually or even annually. This is a great way to ensure you are putting aside money for savings for your children from young. As with any investment, it is recommended that you review your policy to see if the insurance company is allocating your premium for investment and protection according to your family’s needs. Reviewing your policy periodically also allows you to ensure your money is working as hard as possible on the right investment fund. 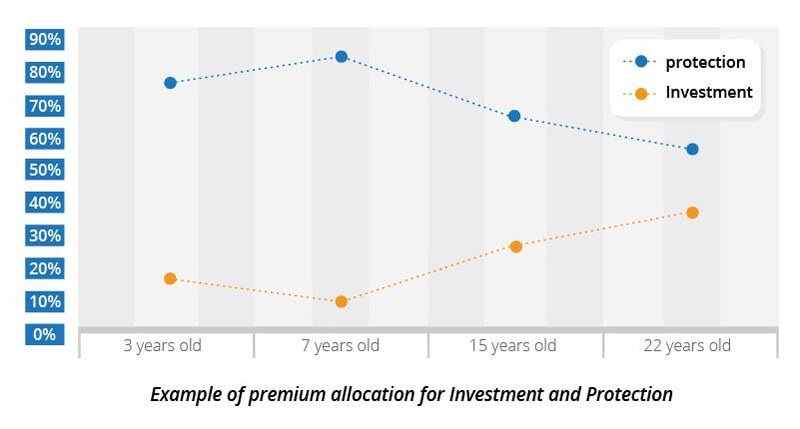 Even though you have committed a certain premium on the policy, the percentage of allocation for insurance and investment changes according to your age and your needs. If you are purchasing an investment-linked insurance policy for your child, protection should be the main focus in the initial years. As your child grows up, you can consider topping up your premium commitment to boost the investment value of the policy so that you get a potentially bigger payout by the time your child enters college/university. To make your money work harder, Zurich FlexiLife Plus also rewards you with Loyalty Bonus, which is equivalent to 0.5% of the average monthly account value over the last 5 premium years, to help boost your Investment Account Value. This loyalty bonus will be paid to you every 5 premium years in the form of unit, until the policy expires at the age of 100, provided that the full premiums are paid on time. Conversely, if you do become more financially well-off in the future, you can choose to boost your Investment Account Value via regular top-up (MaxSaver) from as low as RM 10 a month or one-off top-up (Max Top-up) with a minimum lump sum of RM500. This offers the flexibility in not just the protection, but also in saving towards a person’s financial goals, be it for college fund or for retirement savings. If you have trouble keeping tab in all the insurance policies that you and family members have, you are likely over or under insuring. If you think there’s no harm in over insuring, think again. When you are over insured, you are spending hundreds (if not thousands) of Ringgit protecting yourselves from unlikely incidents, or even overprotecting yourself in one area, leaving other areas uncovered. This will be multiplied if the same happens to your other, or all, of your family members. The reason for over insuring is likely due to taking on too many policies and because insurance is not something that most of us review every now and then, we tend to forget how much we are insured for, or what policies we have already purchased. Having all your insurance needs covered in one policy will make it easier for one to keep track of one’s needs in insurance coverage. Some of the basic insurance policies that one need are life, medical, critical illness insurance, auto and personal accident insurance. Early Care Critical Illness Lump sum financial supports for critical illness, early to advanced stages. Flex Medical Comprehensive medical coverage till age 100 with no lifetime limit. Flex Lady Critical Illness Comprehensive coverage against major female critical illnesses. Flex Maternity Care Protects you and your child during pre-natal and infancy period. Waiver of Premium on Dread Disease Premium waiver benefit that relieves the payer’s financial burden should a critical illness occur. For example, if you are purchasing insurance for the father in the family or your young child, you can opt out of critical illnesses for women and also maternity care. This can ensure your premium will be allocated optimally to ensure you get the protection needed. Your daughter’s policy can also be tweaked later on to include female-related benefits when she is older. These comprehensive insurance policies allow you the flexibility to add on additional coverage to your policies without having to purchase a new plan. Zurich FlexiLife Plus allows policyholders to add on all of these benefits under one policy, consolidating all the premium in one payment. This will give you a bird’s eye view on your insurance needs. Managing insurance protection for the whole family is not easy. Every time a new addition arrives, it’s not just as simple as buying a new policy for the baby, but also reviewing the policies of the breadwinner and caregiver of the family. If you’re the main earner in the family, or even if finances are evenly split between you and your spouse, you’ll want to make sure your insurance coverage is adequate to cover any missing salary for at least several months, if not years. The simplest and most affordable way to bundle all your insurance needs and also your family’s future financial needs is through an investment-linked insurance plan with medical protection and other relevant riders. Payments will be made simple with one policy per person and also keeping track of your coverage to ensure that it keeps up with inflation will also be easier. You can juggle your other financial goals while effectively plan for future insurance expenses as you grow your family. Looking for medical coverage? Compare insurance plans to find out which is the best for you.